Floor Wiper is used to push water from the floor. It has special rubber which increases the life of wiper and gives super strength. • This product will solve all your kitchen slab and window cleaning hassles. • For the first time, spray bottle built inside the wiper. • Get completely dry surface after a single wipe. • Wiper is made with the durable rubber pad enabling a long life of the wiper. • Cleaning liquid can be filled easily in the detachable spray bottle. 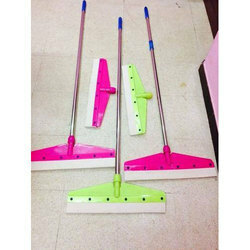 These Steel Floor Wipers are useful for cleaning public premises and Households. Material: With 3 feet pvc coated a grade wooden handle,well threaded so fitting is perfect. 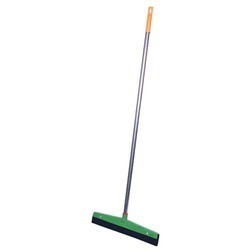 Economy quality 16" floor wiper with 3 feet long handle. We offer a wide range of Floor Squeezer. It is effective on all kinds of flooring, be it cement, marble or tiles. We are engaged in manufacturing and supplying of a vast range of Floor Squeezer. We bring forth Floor Squeezer that is highly appreciated for effectiveness and efficiency. - Squeegee and washer in one tool. Complete with S-Channel, Original Sleeve and Rubber. - Time saving performance without changing tool. Fits securely to pole with.